Visiting Kennebunkport soon? If you are a collector, or just like poking through antique stores, we have several within easy driving distance of the Inn. There’s a number of “Antique Lists” that you can find which gives you a summary of the antique stores in Maine, especially those along Route 1. 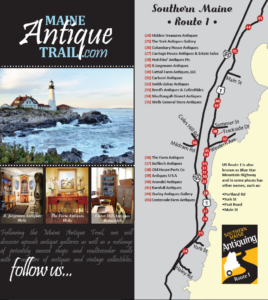 Our favorite is the MaineAntiqueTrail.com which features nearly 70 antique stores in Maine – both along the coast and inland. Updated in March 2017, they list 14 shops within a 30 minute drive of Kennebunkport alone. Heading to Freeport to visit LL Bean? There’s another five you can stop into while there! And for our guests who are heading north toward Bar Harbor, you can shop your way all along Route 1.
their items in this store so stock changes frequently. They have a lot of small items and a great variety of things to pick through. One of our favorite stores, we have purchased some of the pictures hanging on the Inn walls here. 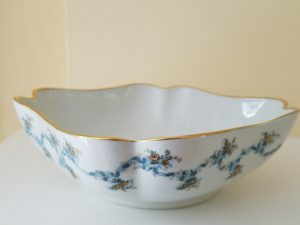 Teri is also a fan of Limoges porcelain and has found several pieces that she couldn’t live without in this store! Arundel Antiques are just across the street on Route 1 and Log Cabin Road. They have more than 200 dealers selling from the space. Great for magazines, postcards, old sewing patterns, etc. in particular. Many of our guests also like to go on Sunday mornings for their “car boot sales” which take place in their parking lot. If you’re looking for old house items, Old House Parts Co. in Kennebunk is the perfect place for you! They specialize in house salvage items from 1730 – 1930. Even if you aren’t buying, this is like a museum of old doors, stained glass windows, woodwork, door knobs, etc. It’s really like stepping back in time. If you’re looking for larger furniture pieces, The Farm Antiques in Wells is well worth stopping in or checking out online. They have a nice selection of tables, chests and chairs in particular as well as some smaller brass, copper and silver plated items and beautiful artwork to choose from. Antiques on 9 in Kennebunk is not featured on the Antique Trail, but we highly recommend stopping in to browse while you are here. This 12,000 square foot store features high end furniture as well as home accents and garden accessories, new and old. Most of the stores will ship if you find something that won’t fit in the car or suitcase! Some are open year around and others are seasonal so it’s always a good idea to call or check online first to make sure they are open. Happy Hunting! This entry was posted in Local Information by 1802House. Bookmark the permalink.